In very primitive plants, this process was carried out by wind or water. Between 245 million and 200 million years ago, however, the first flower-ing plants arose, with the earliest fossil records containing relatives of today’s magnolias and water lilies. During this prehistoric time frame flow-ering plants evolved two major reproductive adaptations: exposed male stamens that bear small, nutrient-rich pollen grains; and enclosed female carpels that protect ovules. These adaptations accelerated plant reproduction (and pollinator diversity), leading to diverse and dominant communi-ties of flowering plants that almost 100 million years ago had spread across the globe. Beetles, flies and wasps are thought to be the first pollinators, accidentally spreading pollen while feeding on flowers. This set the stage for more complex plant-pollinator relationships to evolve, including prehistoric flowering plants that first attracted passive pollinators by providing sugary nectar, protein-packed pollen, fragrant resins, and vitamin-rich fats. 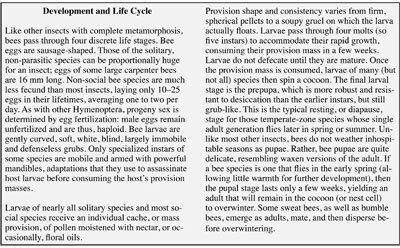 Flowers then responded to particular pollinators, coevolving with them to provide diverse bloom times, colors, scents, shapes, sizes and rewards, and improving their reproductive efficiency. For example, flattened, large, scented, off-white flowers with accessible pollen, such as magnolia, attracted beetles, while tubular, large, scented, white flowers that bloom at night attracted moths. • Separate male and female plants. The widespread distribution of diverse flowering plants 100 million years ago coincided with the appearance of intentional pollinators: bees. 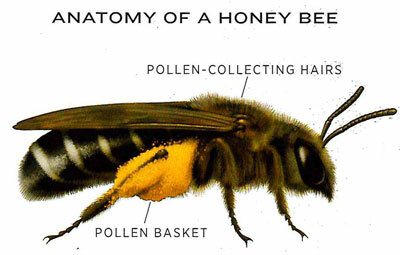 Bees are believed to have coevolved with flowers from predatory wasps. In general, both bees and wasps consume sugars as adults and proteins as larvae. Herbivorous bee larvae eat pollen as their protein source, however, while wasp larvae are typically carnivorous. Although most bees are pollen generalists, capable of foraging on many plant species, many are specialists that forage on only a small group of specific flowers. What Makes a Good Pollinator Plant? Ultraviolet Invitations – Bees can see ultraviolet light but not red light; thus, flowers in the ultraviolet range attract more bee visits, while red-hued flow-ers reduce them. Color Phases – Many flowers signal pollinators by changing color at different stages of development, attracting pollinators when they need them most, thus increasing the efficiency of the pollinators they depend upon. Nectar Guides – Contrasting patterns of flower shades, tints, and tones further direct pollinators toward floral rewards such as nectar or pollen, much like the nighttime runway lights of an airport. Fragrance – Minty or sweet, musky or ethereal, pungent or putrid, floral odors result from variations in chemical compounds. Fragrance can attract par-ticular pollinators over long distances, varying in concentration and intensity according to species, flower age, and site conditions. 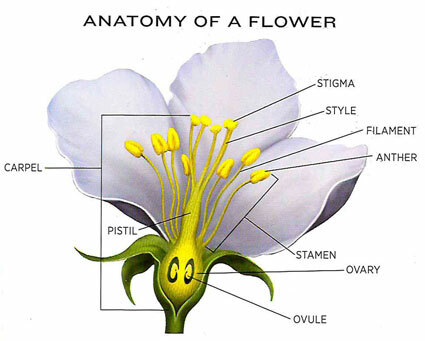 Flower shape, size, and timing work together with color and odor to regulate pollinator visits. Abundant and diverse shapes and sizes, symmetrical or asymmetrical forms, arrangements on stems or branches in simple or complex groups, maturing at different rates: these variations can make it easier or harder for visitors to reach nectar and pollen. For example, shallow, clustered flowers with landing platforms (such as sunflowers) have easily accessible floral rewards and attract many short-tongued pollinators such as sweat bees, beetles, and flies. In contrast, deep or tubular flowers without landing platforms often have hidden floral rewards accessible only by long-tongued or strong pollinators. A classic example of this latter flower type is bottle or closed gentian (Gentiana spp. ), whose flowers remain closed and depend for pollination on bumble bees, which pry the petals apart and climb right inside. Finally, many plants bloom according to a distinct seasonal rhythm – their phenology – which may be closely timed with the life cycle of specific pollinators. Others, meanwhile, bloom continuously or irregularly during the growing season, attracting many different types of pollinators. These rhythms can invite or exclude different pollinators depending upon the season or even the hour. Of course pollinators most often visit flowers for nutrient-rich food rewards: pollen and nectar. The availability and quality of these rewards vary de-pending on time of day, environmental factors, and an individual plant’s life cycle. And from the perspective of a bee, butterfly, or other pollinator, sever-al factors can make a particular flower useful, or not. Floral rewards include pollen, nectar, oils, and/or resins, depending on the plant species. Pollen, the most protein-rich of these rewards, is essential to bee reproduction. Once gathered, adult bees typically mix pollen with nectar and glandular secretions to form a nutritious “bee bread,” which forms the diet of larval bees. Pollen grains vary from 10 to 100 micrometers in size, have distinctive shapes, and commonly contain protein levels ranging from 2 to 60 percent (including 10 essential amino acids, as well as varying concentrations of carbo-hydrates, lipids, sterols, and other micronutrients). While some bees, such as the common European honey bee, are generalist pollinators whose diets are not restricted to particular pollen types, others are specialists of pollen from particular flowers, including various mining bees, cellophane bees, and resin bees. Nectar is composed chiefly of carbohydrates and water, with low levels of amino acids, lipids, proteins, and various vitamins and minerals. Carbohy-drates, primarily the sugars sucrose, fructose, and glucose, can range in concentrations from 10 to 70 percent based on species and weather. It is this sug-ar-rich food source that fuels adult bees, butterflies, and a myriad of other flower visitors, such as bats and hummingbirds. Nectar secretion, even within the same species of plant, can vary depending on humidity, precipitation, time of day, temperature, wind, latitude, soil, and various other factors. In turn, the pollinators visiting those blossoms may encounter short-term booms and busts of nectar availability. Oils and Resins are secreted by some flowers to attract bees. Specialized floral glands produce calorie-rich, medicinal oils that are regularly collected by a few bees (for example, Macropis spp. and Melitta spp.) and mixed with pollen and nectar for feeding and medicating larvae. Most likely, such flower resins first evolved to protect the plants from herbivores or disease. 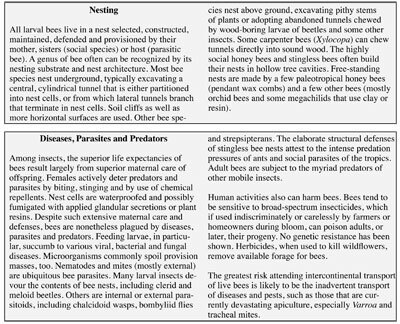 Eventually bees came to use them as a food source, and as a resin for constructing anti-microbial and wa-terproof nests. Nonfloral (or “extrafloral”) rewards include nectar, honeydew, fruits and saps. Honeydew is the sugary excrement of sap-feeding aphids, scale insects, whiteflies, and some butterfly caterpillars (mostly the blues, in the family Lycae-nidae). Like extrafloral nectar, it is eagerly collected by many beneficial insects, including ants, bees, and wasps. In some locations, in fact, aphid honey-dew is found in large enough quantities to produce small surplus honey crops. Honeydew is readily accessible but occasionally it, or the insects producing it, are guarded by ants. Think of ants tending aphids as though they were livestock, and you have a fairly accurate picture of this unique insect relation-ship. Propolis, also known as bee glue, is a resinous sap mixture collected from plants by bees and harvested by humans. Particular plants, including conifers and poplars, exude these resins from buds or from injuries as a natural antimicrobial defense. Honey bees collect propolis to construct and defend hives, weatherproof small cracks and holes, smooth surfaces, dampen vibrations, and protect themselves from bacteria, fungi, mites, and other intruders. Hu-mans harvest and use honey bee propolis in cosmetics, soaps, medicines, and wood polishes or varnishes. 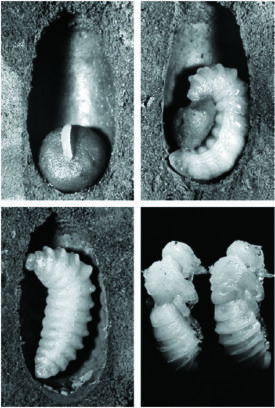 Species of solitary mason bees also collect propo-lis to construct, partition, and seal nests. Beyond pollen and nectar, plants sustain pollination in several other ways, and the most familiar of these is as caterpillar food for butterflies. With only a few exceptions, the vast majority of butterfly and moth caterpillars are herbivores that feed exclusively on plant foliage. Depending on the species, those caterpillars may be generalists, which can feed on many types of plants, or specialists with a very narrow range of plants on which they can successfully feed. The specialists often acquire defensive chemical compounds from the plants they feed upon (such as alkaloids, cardenolides, or glycosides) that make those insects unpalatable or toxic to predators. For example, milkweed butterfly caterpillars such as the monarch and queen feed exclusively on milkweed (As-clepias spp.) foliage, which contains toxic cardenolides that repel most vertebrate predators. Other than food resources, plants also offer nesting, egg-laying, and overwintering resources for pollinators, such as hollow or pithy canes; stalks, stems, or twigs; leaves, petals, or plant fibers; and exfoliating or peeling bark. Plants with hollow or pithy branches, such as brambles (Rubus spp. ), elderberry (Sambucus spp. ), and sumac (Rhus spp. ), are used extensively as nesting spaces for a wide range of wild solitary bees and wasps. Nearly 30 percent of North American native bee species nest in hollow stems or abandoned beetle borer holes – including leafcutter bees (Megachile spp. ), mason bees (Hoplitis spp. ; Osmia spp. ), small carpenter bees (Ceratina spp. ), and masked bees (Hylaeus spp.). Leafcutter Bees cut round sections of leaves or petals to wrap around their developing larvae and pollen stores, similar to a carefully wrapped origami package. Wool Carder Bees (Anthidium spp.) comb plant fibers from the surface of fuzzy leaves and use them to create a wooly, felted plug that closes off the en-trance to their nests inside hollow stems. Foraging for food can be risky for pollinators. In the process of visiting flowers, an individual insect may encounter predators, disease vectors, or bad weather. The farther an insect has to travel, and the more energy it has to exert in collecting food, the more risk it is exposed to. Plants that provide an abundance of quickly accessible, nutrient-packed pollen and nectar obviously provide the greatest reward, and allow insect visitors to get on with the business of mating and reproduction. Landscapes with a wide diversity of blooms more effectively sustain pollinators throughout the seasons than do landscapes dominated by only a small handful of flowering plants. At a landscape scale, the presence or absence of different types of blooming plants can result in a “feast of famine” situation for pollinators. Thus, expansive landscapes of weedy or invasive plants such as purple loosestrife (Lythrum salicaria) or Himalayan blackberry (Rubus ar-meniacus) may provide an abundance of food for bees and other pollinators during their bloom period. Once the bloom is over, however, pollinators may suffer as those same invasive plants that temporarily sustained them now crowd out other types of wild plants that would otherwise have provided a variety of flower types throughout the entire growing season. 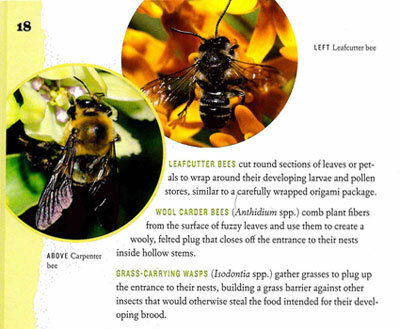 Here are some basic guidelines to consider when creating habitat for bees. Provide large and contiguous habitat patches. Where possible, pollinator gardens, wildflower meadows, and habitat patches at least 5000 square feet in size offer a wonderfully productive landscape feature for sustaining honey bees, butterflies, and countless wild bees alike. To sustain wild pollinators for crop production on farms, the current research suggests that 10 to 30 percent of a farm should be maintained in natural habitat to support both wild bees for crop production and beneficial insects for natural pest control. Within these areas, plants can be scattered about but clumps or groupings of similar plants (of at least 4 square feed [1 square meter]) seem to be espe-cially attractive to pollinators. This proximity reduces their foraging time so that they can spend more time mating, nesting, and raising future generations of pollinators. Plant diversity also enhances pollinator populations, as previously mentioned. To attract a great diversity of wild bees, a landscape should feature at least 12 to 20 species of flowering plants and have at least three species of blooming plants at any given time. Most important, whatever you plant, the habitat must be protected from insecticides. We recommend at least a 50-food-wide buffer (preferably 100-foot) between any pollinator habitat and areas such as cropland where insecticides are used. Native plants should always be prioritized in creating pollinator habitat. While nonnative species can provide complementary benefits (such as cover crop plants for enhancing soil health, or edible landscape plants such as fruit trees), native plants typically offer the best adaptation to their environment and they have co-evolved with the many bees, butterflies, and other wildlife within their respective regions. Ideally, we encourage you to protect, collect, and sow seed from native plants that originate within or near your own community. While native plants are ideal, introduced plants are often an irreversible presence in our humanized landscapes. Many of these species can offer copious floral rewards for pollinators. Select introduced plants with caution, however, and carefully avoid invasive or noxious plants to protect native plant com-munities and the wildlife that depend upon them.